Pineapple is a terrific tropical treat. Though Hawaii is known for its pineapple, Taiwan and Thailand have become popular sources too. To make this snack, the pineapple fruit is peeled and sliced into various sizes and soaked in a sweet mixture that gives it a nice bite. 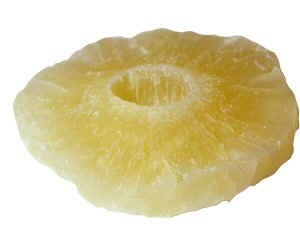 These pineapple rings are a substantial and tasty treat. We use pineapple in our trail mixes and they're popular in health food stores as a more natural dessert treat.